Nagano Prefecture (, Nagano-ken) is a prefecture of Japan located in the Chubu region of the island of Honshu. The capital is the city of Nagano. Due to the abundance of mountain ranges in this area, the land available for inhabitance is relatively limited. Nagano has impressive highland areas, including most of the Kita-Alps Northern Alps, Chu-Alps, and Southern Alps, which extend into the neighboring prefectures. In addition to its natural scenic beauty and rich history, Nagano was host to the 1998 Winter Olympics, which gained the prefecture international recognition as a world-class winter sport destination, and a Shinkansen line to Tokyo. Nagano is an inland prefecture and it borders more prefectures than any other in Japan. Nagano contains the point furthest from the sea in the whole of Japan - this point lies within the city of Saku. The provinces mountains have made it relatively isolated, and many visitors come to Nagano for its mountain resorts and hot springs. Nine of the twelve highest mountains in Japan can be found in Nagano and one of its lakes, Lake Kizaki, is a beach resort popular for its water attractions and games. As of April 1, 2012, 21% of the total land area of the prefecture was designated as Natural Parks, namely the Chichibu Tama Kai, Chubu-Sangaku, Joshinetsu Kogen, and Minami Alps National Parks; Myogi-Arafune-Saku Kogen, Tenryu-Okumikawa, and Yatsugatake-Chushin Kogen Quasi-National Parks; and Chuo Alps, Enrei Ojo, Hijiriyama Kogen, Mibugawa Suikei, Ontake, and Tenryu Koshibu Suikei Prefectural Natural Parks. 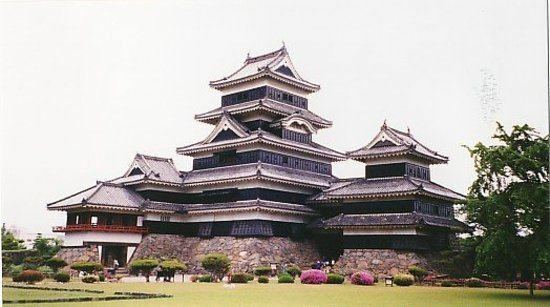 Matsumoto Castle, one of Japans national treasures. One of the worlds highest geysers (about 40 to 50 meters) in Suwa.